These three scripts are on the same page because they are examples of the same type of logic. 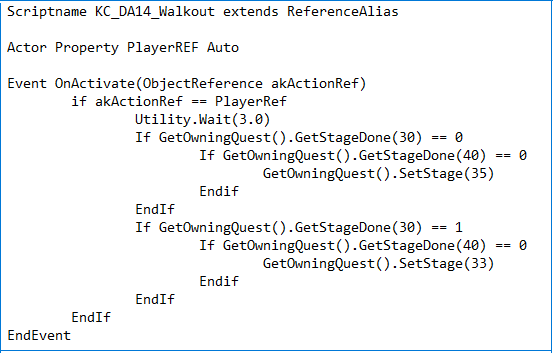 Each script is unique, but they are all concerned with correctly updating quest states based on the players interaction with some kind of object; activating an NPC, activating a door, killing an NPC. What is interesting about Papyrus, and Skyrim, is that quest states themselves usually have all the interesting commands. Don't worry, I wrote interesting commands there.